We still have a while to go on season 7 on TV, but for the cast and crew, Arrow‘s penultimate year is now finished. We even got a peak at what must have been an epic wrap party for Team Arrow, courtesy of Katherine McNamara, who joined the show this season as Mia AKA Blackstar. Introduced in the flash-forwards that have run through season 7, fans immediately took to the character and were overjoyed when it was revealed that she was actually the daughter of Oliver Queen and Felicity Smoak in the “Star City 2040” episode. 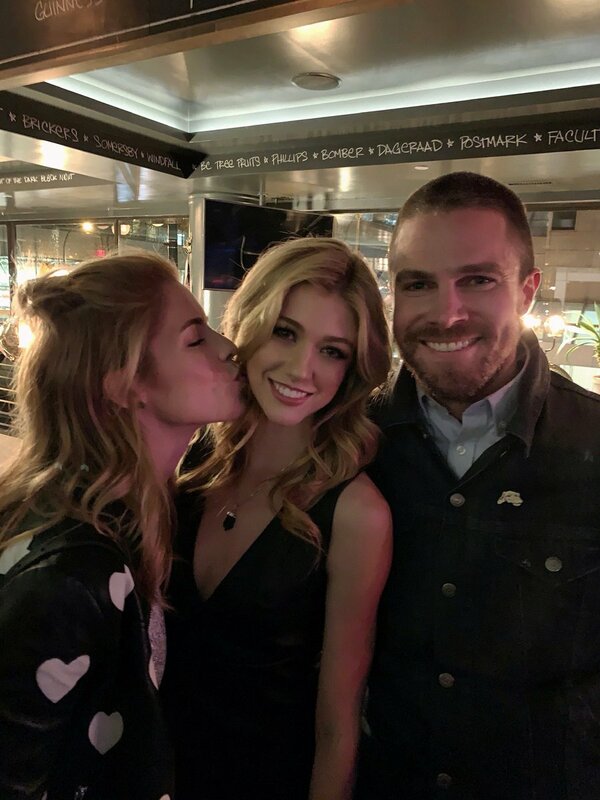 The below photo is something of a family reunion, then, as it sees McNamara cozying up with her on-screen parents, Stephen Amell and Emily Bett Rickards. Unfortunately, the timeline issues mean we haven’t seen Mia with her parents like this on the series itself – at least, not yet – but this snap does make a perfect partner to a set pic shared by Arrow EP Marc Guggenheim the other week. After many pleas from Olicity lovers, he posted a photo of Ollie and Felicity with baby Mia, a scene only briefly glimpsed in the episode which touched on the character’s backstory. Arrow is, of course, ending after its truncated 10-episode eighth season this fall, but fans aren’t ready to let go of the Emerald Archer’s world just yet and are hoping for a spinoff. Specifically, a series built around Blackstar in the 2040 timeline. Intriguingly, showrunner Beth Schwartz didn’t rule out the idea in a recent interview, confirming that she hopes certain characters get to live on beyond Arrow‘s end. Sadly that’s not possible for Mia’s mom, though, as Rickards is set to leave the franchise following season 7’s close. The Arrowverse is always expanding though, so who knows what’s going to happen on this front? While we await any news, be sure to catch Arrow season 7 as it continues next Monday on The CW.